Cat Crimebusters and Other P.I.s On Paws, Part 2 – Book Reviews By Fred Patten. The Mrs. Murphy series by Rita Mae Brown is another animal crime series where the animals actively detect, rather than just tag along with the human amateur detective while she (it’s invariably a woman) solves the mystery. 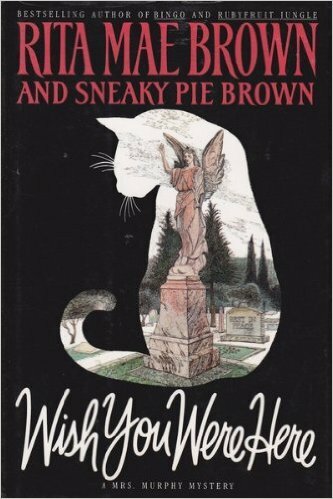 The Mrs. Murphy books, officially in collaboration between Rita Mae Brown and her tiger cat, Sneaky Pie Brown, are up to 24 novels. The next is coming in May 2016. Wish You Were Here. November 1990. Rest in Pieces. June 1993. Murder at Monticello. November 1994.